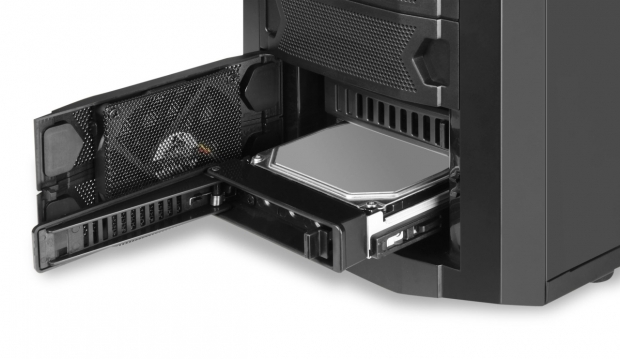 With the Scorpio, Sharkoon presents their first tower in which SSDs as well as hard drives with 2.5 inch Form Factor can be used without any special adapter frames needing to be installed: Behind the mesh drive faceplates on the completely black SECC tower are four drive bays for suitable smaller data mediums. In addition, there is space for a total of six 3.5 inch drives. Two of the six 3.5 inch mounting bays are equipped with a Fast Swap Mechanism directly on the housing front which enables the easy installation of SATA hard drives: Installed on the backside of the mounting cage is a panel with two internal SATA ports. The user only needs to open the faceplate panel, remove one of the two secured mounting frames using the locking lever, screw the hard drive to the frame and re-secure into the bay. The tower panel provides a 4-pin power supply adapter and two unregulated fan connectors beside the two SATA connectors. In addition to the hard drives, the Sharkoon Scorpio can include up to seven extension cards and up to five 5.25 inch drives. 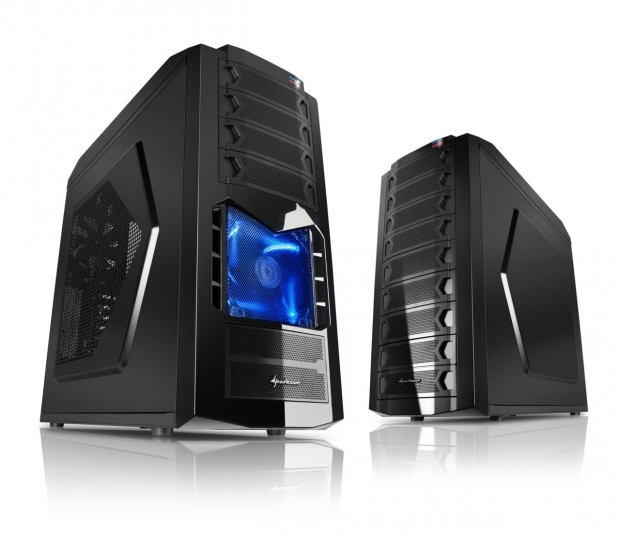 The drives can be secured by thumbscrews thanks to the laterally adjustable mounting rails. For a clean cable management system within the black finished interior there are several cable bays and feed-throughs provided. The main board panel also has an opening to easily mount a CPU cooler. Through the rubber protected openings on the back of the tower an e-SATA cable and two water cooler hoses can be installed. The power supply sits on the bottom of the tower over the air intake with a removable dust filter and allows, depending on the preferred ventilation, the fan to be installed in either an upward or downward position. The top I/O panel provides an eSATA and two USB2.0 ports, headphones and microphone ports as well as the Power and Reset buttons. The tower measures 508 x 210 x 503 mm (L x W x H) and weighs around 7.25 grams.